Warwick is an ancient dragon shifter who also happens to be a loan shark of sorts for other shifters. Alpha Montgomery needed money and Warwick was the shifter to help him; however, when he can't repay his debt, Warwick makes the alpha a different offer. Avery is an Omega in the pack, they are to be treasured and treated as if they are made of glass. However, when he is given to Warwick as payment, he proves he is not as weak and everyone assumes. I loved that Warwick was hard and cold with everyone, but when he was with Avery he was warm and snuggly. I enjoyed the interactions between Avery and Warwick, they were very different around each other to when they were with other people. Now a few problems; every time Avery said "oh gods" it made my eye twitch. It was said far too many times. Also, I felt the ending was quite rushed, I would have liked an epilogue to tie things up. Overall, I enjoyed the book and would read another from this author. 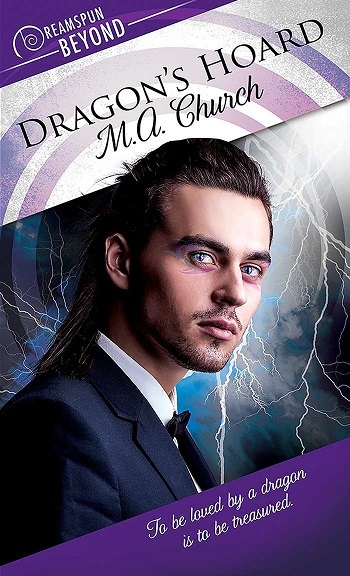 She is a member of the Science Fiction and Fantasy Writers of America..
Reviewers on the Wicked Reads Review Team were provided a free copy of Dragon's Hoard by M.A. Church to read and review. Probably precious gems so I could trade them for books! I so want to read this book. I would hoard gold, jewels, and books. LOL, I have no clue. Books if I could. Can I count books as my baubles? I'd totally hoard my favorite authors! I totally love shiny, glittery things. I would be hoarding anything that fit the bill. I would hoard any odd thing that caught my eye. Plus beautiful books. I'm not a dragon shifter but I already hoard books so I don't think anything would change much. I'd most likely hoard books. All the books!